Monday I skipped my morning gym class in order to do my long run that night. I needed the rest of the week to do small runs and rest up before the Iron Cowboy comes home to Utah for his final Ironman distance triathlon. The plan is for me and Trev to run the marathon part of it with him. If that actually happens, we will see on Saturday. I planned to run 15 miles. And I was doing it all on the treadmill. 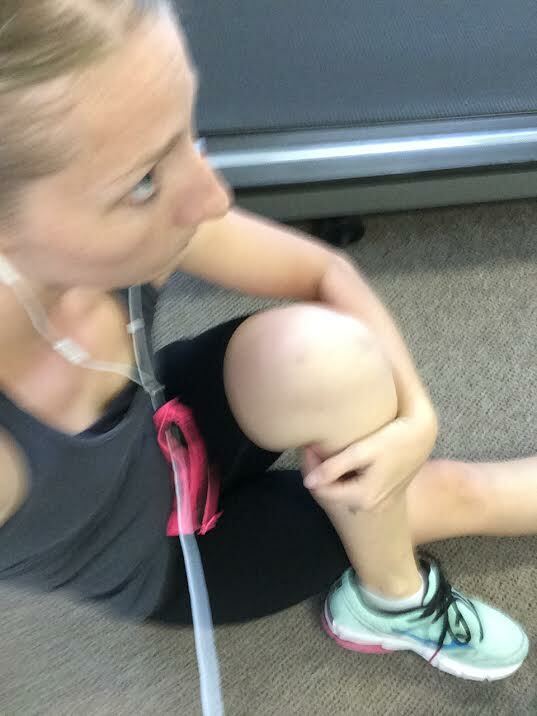 The only reason I chose to do it all on the treadmill was just because I tend to have a hard time pacing myself outside. And if I want to go that far, I need to pace myself really slowly. The only way I knew that would happen the whole run is if I did that on the treadmill where I can control the pace. So I started out with stretching, like a good little runner should. I always forget to stretch, or just skip it because I feel like it takes too much time. You should never skip stretching though! That's how people get injured. Last time I did a long run like this, it really hurt my hips and feet. So I made sure to stretch those. 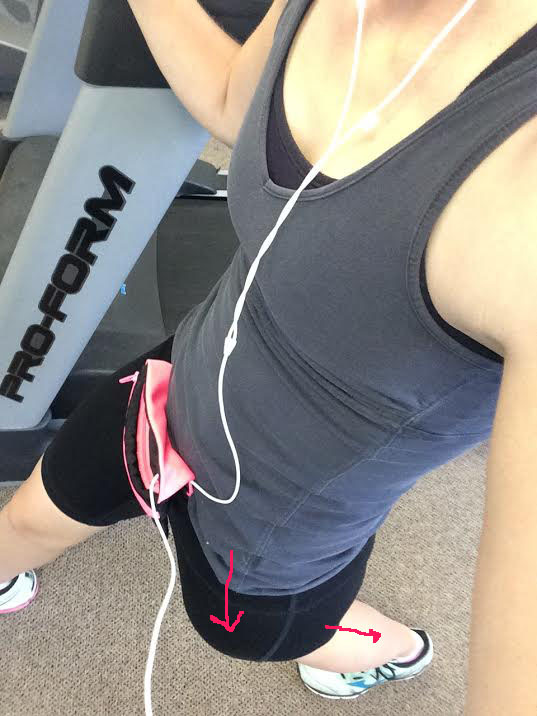 This is a good one for hip flexors, thighs and calfs all at the same time. Heres how to do it: Take a big step backwards, slightly bend your knees and rotate your pelvis forward a little bit until you feel a stretch. Hold it there for a few seconds and then do it with the other leg. Hip flexors are not fun to pull. I know that from experience. So stretch. After I was all stretched I decided I'd better not waste any more time and get going. This was my view for the next 3 1/2 hours. Because it's been several years since I've run like this, I called my cousin (the one I ran with in THIS race) for a little long distance advice. She does these things a lot more often than I do at this point. She told me when she runs marathons she plans to stop every 3 miles for water, 6 miles for gatorade and she eats half a banana every 6 miles as well. The banana is not only fuel for you to keep going, but it also helps with cramping. I get a lot of cramping now in my legs when I get past 10 miles. So I took all my gear with me. 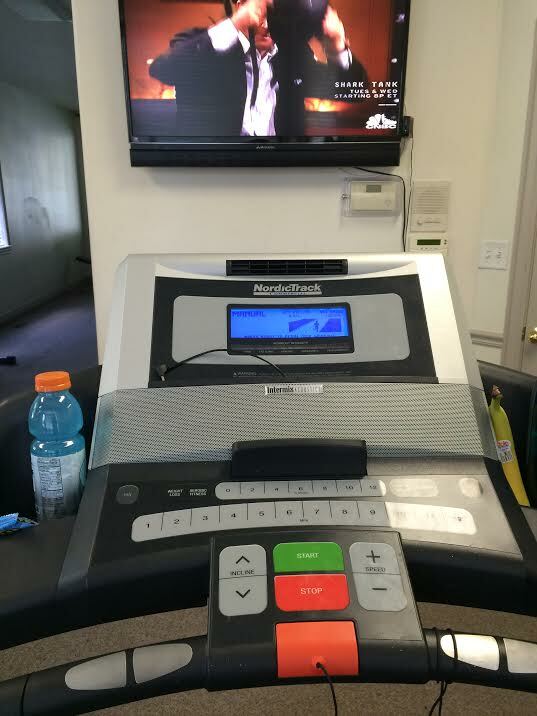 Lucky for me, The Avengers was on for most of my run. That helped me keep my mind of the pain. At my 7 mile mark, my sister in law showed up at the club house (we live around the block from each other, and I love it). I was so glad to see her. It gave me someone to talk to and to keep me going longer. The pace was slow enough that I never really felt tired. I could carry on a conversation just fine. But once my sister in law left the pain started to set in. So I ate some of the banana and it helped hold me off again. Then my sister showed up. I had told her that I was running so she decided to come with me. Thank heaven, because by this point my legs felt like they were going to fall off. When she left, I had 3 miles left in this long run. I stopped and ate another piece of banana, took some gatorade and while I was eating it, I made sure to stretch a little more. That helped again, but not as much as before. I know I definitely went into these long training runs way too quickly. And normally I would take much more time to add that many miles on to my runs. But I really wanted to feel like I could run at least the half marathon with James (Iron Cowboy). I do NOT recommend adding that many miles on all at once to anyone! I know my body and I know when to stop. I've been doing this for a long, long time. But you can get very hurt by adding that many miles on all at once. So again, don't hurt yourself. Listen to your body and take breaks when needed. For those of you who live in Utah, and aren't doing much Saturday afternoon/evening around 7PM, come out to Thanksgiving Point and run the 5k with James! It's his last event, his 50th Ironman distance tri. Come support him in spreading the word about childhood obesity and have a great time. What is the furthest you have been running lately? What are your favorite stretches to do?